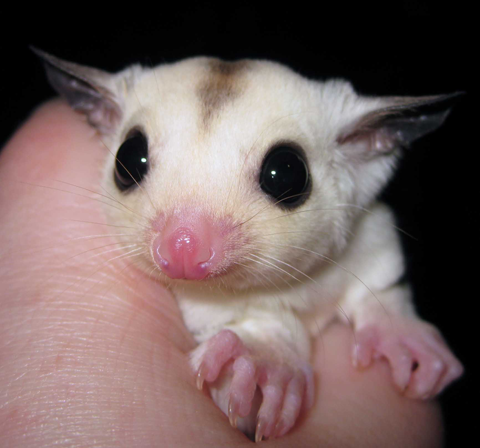 Sugar Gliders are amazing little marsupials that once bonded to you, will stay bonded for life. This process does take a number of weeks to months and learning to go at your gliders pace is very important. When you bring your glider home, set up their cage and leave them be for 24-48 hours. Don't try and pet them, or reach in to pick them up. Let them get used to their new scary surroundings and get the courage up to eat and explore. After day two, sit by the cage and talk to them, if they are very nervous do this with the door closed. Don't worry if they crab, this is normal, they are just afraid of you and it will take a little time for them to understand you're not a big scary monster!! The next step is to open the door, put your hand inside but don't reach for them, let them see your hands are not something to be afraid of, if they come to check out your hand, keep it still, let them sniff/lick, they might even nibble to see if you're edible. Once you've gotten them this far, start offering treats from your fingers, yoggies, dried fruit and meal worms generally are treats most sugar gliders enjoy, you'll quickly learn which ones your joeys like the most. Once they are comfortable taking treats from you, you can try to pet them after they've taken the treat. If they run away, just go back to talking to them and try again later. Never force yourself on them and never ever chase them around the cage, this will make the bonding go backwards, we want them to keep going forwards! Eventually they will begin to trust you more and more, will come to the front of the cage when they see you, will climb out and onto your hand. Learn your sugar gliders likes and dislikes and work with that and you'll be best of friends in weeks! Tent bonding is a wonderful way to work with your sugar gliders to help them learn to trust you in a safe environment where they can run around and on you, but still feel safe. When taking unbonded sugar gliders into a tent, it's a good idea to do this when they are in their sleeping pouch. Carefully close up the top of the pouch so they can't jump out and carry to the tent, climb in, zip up and then lay the pouch down and let them come out at their own pace and spend as long as possible giving treats, talking and just hanging out. This is an excellent way to speed up the bonding process. To put them back, hold out the pouch and if they don't climb back in, you can use a piece of fleece to gently get a hold of them to put them in the pouch to go back to their cage. Pink Teddy Bear Sugar Glider Hat - LAST ONE!